Present simple is one of the most important tenses in English. It is quite easy to teach and learn but it must be done properly. In this post I am going to teach some vocabulary first and then teach the forms using the verbs. In this post you can find a worksheet, a video and an interactive quiz to teach the vocabulary for daily activities. Once your students know the verbs it is time to introduce the forms – present simple tense affirmative, present simple tense negative and present simple tense questions. If you need the pronunciation, you should try the following video. In the second part of the video there is a quiz to practise the words. There appear the words and you have about 3 seconds to say the word before you hear it. 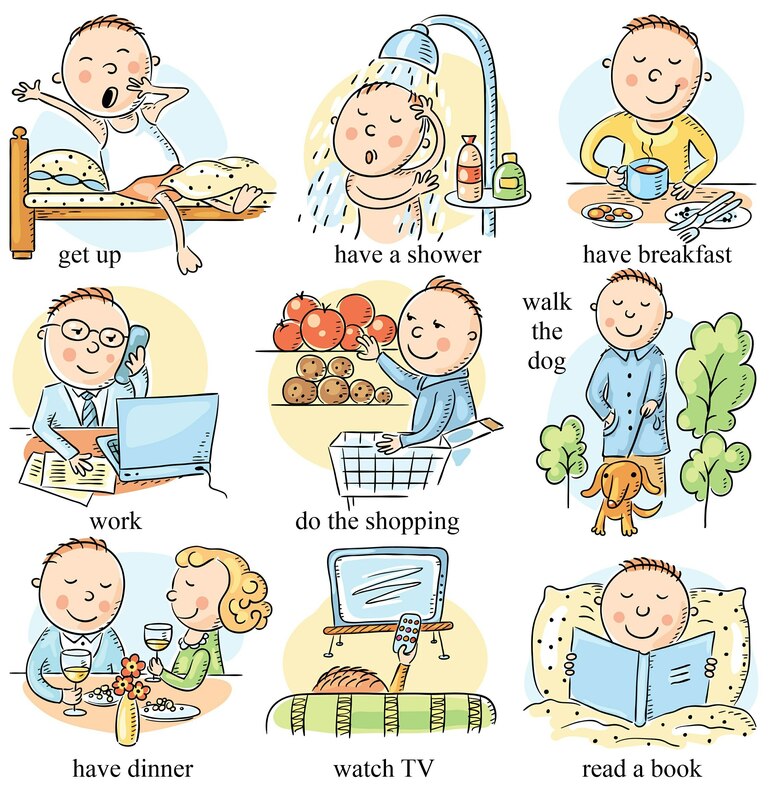 To practise the vocabulary there are several activities. The first one is an interactive quiz. You have three tasks. First, match the words and the pictures, second, click the correct image and third write the words. The quiz is in HTML5 so it will work anywhere. If you would like to play the quiz on the full screen, click the following button. When the students know the vocabulary, I believe it is time to introduce the grammar. Here is a short song to practise the daily activities. It may serve as a good way to introduce the grammar too, as all the sentences are in present simple tense. The infographic contains a lot of details. If you think it would be too much for your students, feel free to cut it into parts and present the different forms at different times. To help my students remember the grammar, I tell stories. I tell them in their mother tongue as their purpose is to help the students remember the grammar. I have already presented the story about questions here and you can find it in our post on Questions. Here, there are two more stories to highlight the grammar. The first story explains why people use the ending -s in third person singular. Nikola (use students’ names, it is more fun and people listen) cook PSST very badly. Adam play PSST football. Jane like PSST English. And so on. And as people spoke quicker and quicker they soon reduced the PSST sound to the ending -s. So ever since when we speak about 1 person who is not me or you, we use the ending -s.
The other story explains the usage of DON’T. “Do you like music?” people asked. People spoke about these bells everywhere. “They dong like music.” “They dong work.” And as the time passed they changed the DONG sound to don’t and ever since we use DON’T in negative sentences. Later people added the form DOESN’T in third person singular. And what happened to the bells? As they could not do anything they put them back on the tower and they never became alive again. To practice the grammar I have created the following interactive quizzes. The first quiz is a game calleed On Target. Your aim is to choose the correct answer and then shoot as many bad ducks as possible. You can shoot a bottle on the side too and win a bonus. The game is in flash and it plays on desktops only. To play the game on the full screen, click the button below. The second quiz is in HTML5 and thus it will play everywhere. You might miss here a worksheet with some communicative activities. So do I. But as I do not have any I would like to ask you to send me yours. If it is good and I decide to publish it here, I will Paypal you 10$. Please send the worksheets to rotreklzdenek@gmail.com. Thank you. Remember the worksheets have to be your own. It’s cool! Thanks a lot. thank you, that’s an interesting way to teach the students .